As I mentioned in our last post introducing our meal plan for Friday, Patrick and I planned a smaller Thanksgiving Day meal in anticipation of a larger meal on Friday since my parents would be visiting. There was a whole ham! There were multiple sides and dessert! 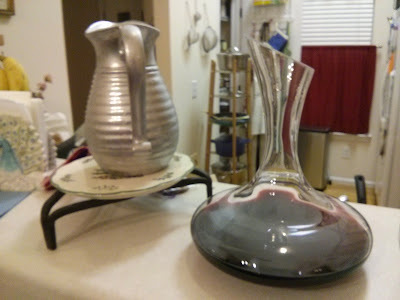 There was even wine in a carafe! And there were Christmas dishes! 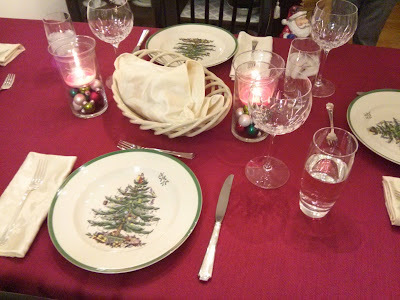 The Wednesday before Thanksgiving I had filled our cabinets with our Spode Christmas Tree dishes. In 2011 we started our collection with a 12pc set (4 place settings) and now we've grown to 12 place settings with various serving dishes! Our celebratory holiday meal here featured a honey glazed spiral sliced ham, sweet potato gratin, green beans with a mushroom cream sauce and cheesecake with a graham cracker pretzel crust! We served fresh homemade crusty bread alongside the meal. Read on for the recipes! Patrick and I took the easy way for preparing the ham. We purchased a Smithfield Crunchy Glaze Spiral Sliced ham and warmed it according to package directions. The ham is precooked and presliced. Before it finishes in the oven there is an included glaze packet to smear on the ham for tasty goodness. Preheat oven to 350F. Rub a shallow 2 qt baking dish with a little butter. Combine the cream with ¾ c water in a liquid measuring cup and set aside. In a small bowl combine the bread crumbs, 1 tbsp of the olive oil, the parsley, and a big pinch of salt. Stir well and set aside. In a medium heavy nonstick skillet, heat the 2 tbsp butter and the remaining 1 tbsp olive oil over medium-low heat. When the butter has melted, add the onions and ¼ tsp salt, cover, and cook, stirring occasionally, until softened and translucent, about 5 minutes. Uncover, raise the heat to medium, and continue to cook, stirring frequently, until the onions have shrunk and browned in places (some more than others), about 8 minutes more. Add the garlic and stir until softened and fragrant, about 30 seconds. Add all the spinach to the pan and toss with the onions until the spinach has completely wilted, about 1 minute. Transfer the onion and spinach to the gratin and smooth with a silicone spatula into one thin, even layer. Peel the sweet potatoes and potatoes. Halve them lengthwise and turn the halves cut-side down. Using a very sharp knife, cut them crosswise into very thin half-moon slices. Put the potatoes in a mixing bowl. Add the cream-water mixture, the cheese, and the remaining parsley, the mustard, ¾ tsp salt, and several grinds of pepper. Mix well. Using your hands, lift the potatoes out of the bowl and transfer them to the prepared dish, arranging them as evenly as possible over the spinach and onions. Pour and scrape the liquids and anything remaining in the bowl into the dish and distribute everything evenly, adjusting the potatoes as necessary to even the top. Using your palms, press down on the veggies to bring the liquids up and around them as much as possible. Top with an even layer of the bread crumb mixture. Bake in the preheated oven until the veggies are tender when pierced with a fork, the bread crumbs are brown, and the juices around the edges of the gratin have bubbled down and formed a dark brown rim around the edge, 60 to 65 minutes. Let cool for 15 minutes before serving. Meanwhile, melt the butter in a pan over medium heat. Add the onions and saute until tender, about 4-6 minutes. Add the garlic and thyme and saute until fragrant, about a minutes. Add the cremini mushrooms and saute until the start to caramelized and turn golden brown, about 10-15 minutes. Add the cream and parmigiano reggiano, season with salt and pepper and simmer until it thickens, about 2-4 minutes. Meanwhile steam the green beans. Remove the mushrooms from the heat and mix in the parsley. Serve the green beans covered in the mushroom sauce. For the Crust: Preheat your oven to 300 degrees. In a mixing bowl, combine the pretzels, graham crumbs, sugar and melted butter. Add a pinch of salt and then press into the bottom of a 13x9 clear glass baking dish. Set aside while you make your filling. For the Filling: In the bowl of a mixer fitted with a paddle attachment, cream the softened cream cheese on medium speed, scraping the sides and the beater occasionally. Next, add the sour cream and continue to mix until combined. Next, add the sugar and continue to mix until combined. With the mixer on low, add the eggs one at a time, thoroughly mixing in after each addition. Add the vanilla. Pour the filling over the crust and bake for 1 hour or until the center is no longer jiggly. Remove the cheesecake from the oven and let sit for a few minutes while you prepare the jam. In a small sauce pot-melt the strawberry jam over low heat. When it is melted, strain in to another bowl if you prefer no seeds. Pour the melted jam over the top of the cheesecake and smooth out in to an even layer. Let the cheesecake sit out to cool for another 30 minutes to an hour, then slice in to 24 squares while still warm. Refrigerate for a few hours to chill completely. I must admit after this Thanksgiving weekend I may have finally felt like an adult. I've gone to college and I've gotten married but feeling like an adult really sunk in after hosting parents for an official holiday. And you two did a wonderful job - perfect meal, home beautiful, and perfect hosts! The sweet potato and spinach gratin was so good and who would have ever thought to combine those two things!